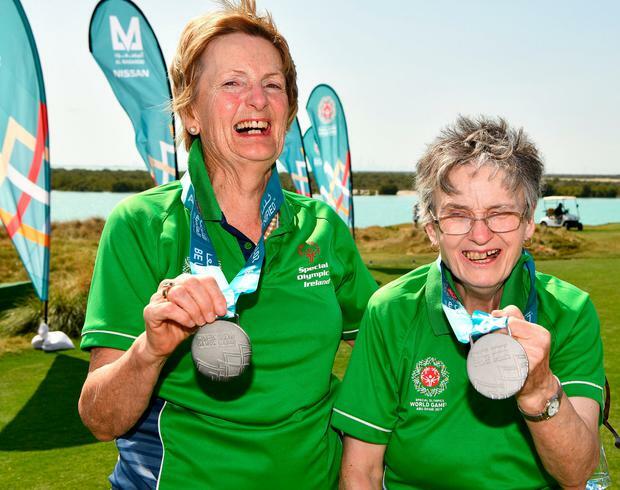 A big birthday bash is in the pipeline for two months' time when Clare woman Mairead Moroney reaches the landmark age of 70 - but it'll take some doing to topple a silver medal at the Special Olympics as the oldest participant in the games. With the wise words of Padraig Harrington still ringing in her ears, and sporting her lucky shoes recently signed by the Ryder Cup captain, her fate was probably written in the clear blue skies shining over Yas Island links in Abu Dhabi. "Up the Banner," Ms Moroney shouted as she waved the heavy round silver object now wrapped around her neck. And her Alternate Shot Team Play partner Jean Molony was just as ecstatic when the pair lined up in front of the Irish press pack in the UAE. "There's not a dry eye at this golf course," remarked one volunteer as Ms Moroney said she had "enjoyed every bit of it". "I'm very proud of my country in Ireland. It was a big surprise when I was informed I was coming out [to Abu Dhabi], I couldn't get over it." The journey began in Charleville, Co Cork, where the pair won gold a little over a year ago, Ms Molony said. "That entitled us to play in the Ireland Games last June and we won a medal there and we got a letter there informing us that we'd been chosen to be part of the Irish golf team in Abu Dhabi," Ms Molony said. After that came the training in Portmarnock and the Grange, clinics with Harrington, and trips up and down to Dublin "like yoyos" - and it all paid off in the end. "I enjoyed meeting Padraig Harrington, I had my photo taken with him," Ms Moroney said. With a silver in the back pocket, would she be aiming for another crack at the Special Olympics in 2023? While there was barely a thought of the fact she'll be 74 years of age when that one comes around, Ms Moroney suggested it could be better to give someone else a chance. Asked about how unique it is for someone of her age to be competing, Ms Moroney laughed it off entirely, insisting: "I'm tough as nails." Meanwhile, around the rest of the course, Ireland continued to dominate, collecting four gold medals, a silver and a fourth-place ribbon on the final day of competition. Sensationally - but not unsurprisingly given his namesake - a certain 'S Lowry' managed to hit an albatross shot in his final round. Simon Lowry (27), from Galway, finished up in Abu Dhabi with a gold medal for his efforts. The golfer may have stolen the limelight, but the football team are deserving of a mention after their 7-2 hammering of Estonia on Tuesday ensured they left for Dublin Airport with bronze medals in their gear bags. 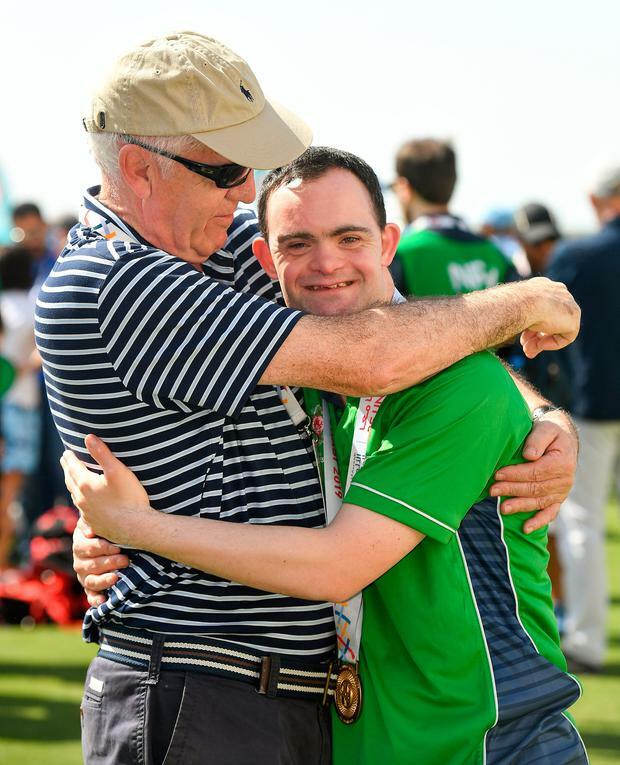 A total of 81 medals in the desert, not a bad week's work for Team Ireland. 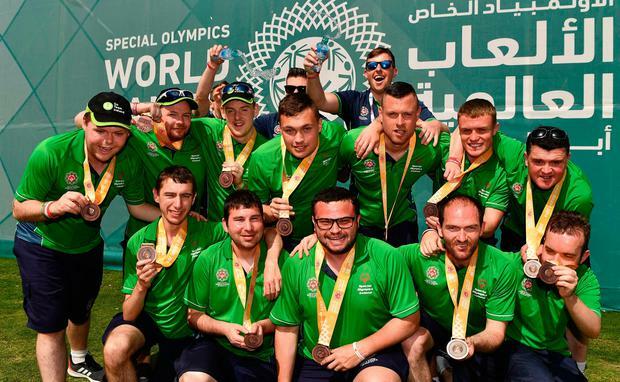 Ryan Nugent BOUNCING into Zayed Sports City Stadium and with smiles beaming brighter the Olympic torch, Team Ireland finally arrived back on the world stage in Abu Dhabi.